When contractor clients build multiple construction projects a year, it can be time-consuming to issue a policy before the start of every new project. A builders risk reporting form policy can help contractors and agents easily manage insurance coverage for new and remodeling projects. But when clients don’t accurately report their course of construction projects in a timely manner, they could experience a lapse in builders risk coverage in the event of a loss. 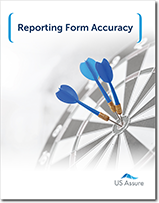 Complete the form to download our free resource and learn more about these simple steps to make the reporting process even easier for you and your contractor clients.